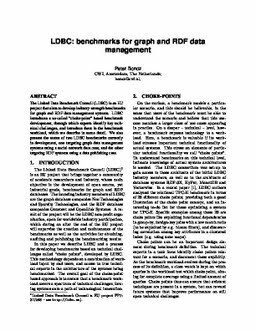 The Linked Data Benchmark Council (LDBC) is an EU project that aims to develop industry-strength benchmarks for graph and RDF data management systems. LDBC introduces a so-called "choke-point" based benchmark development, through which experts identify key technical challenges, and introduce them in the benchmark workload, which we describe in some detail. We also present the status of two LDBC benchmarks currently in development, one targeting graph data management systems using a social network data case, and the other targeting RDF systems using a data publishing case.